Einstein’s theory of specific heat based on phonons leading to unphysical results at the nanoscale is modified by photons that allow phonons to be the heat carriers at the macroscale, but photons are the heat carriers at the nanoscale. Nov. 2, 2010 - PRLog -- Background Discussions at the Asian Thermophysical Conference (ATPC) held recently in Beijing showed most attendees thought specific heat is an intensive property independent of the size of the body allowing macroscopic data to be used at the nanoscale. Surprisingly, the attendees did not seem aware that this has led to unphysical results for nanoparticles (NPs). For example, by simply dispersing NPs in a solvent, the NP specific heat is claimed to increase above bulk. Experimental data was based on a thin 10 mm layer of CuO nanofluid between an insulator and 160 mm diameter flat heater supplying heat Q to the nanofluid. 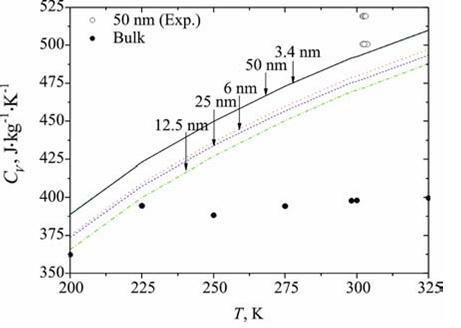 Over a range of NP sizes, the NP specific heat is reported to not only increase above bulk, but also increase with temperature as shown in the figure. See “Surface and Size Effects on the Specific Heat Capacity of Nanoparticles,” International Journal of Thermophysics, Vol. 27, pp. 139-151, 2006. In contrast, quantum mechanics (QM) avoids NPs having specific heat higher than bulk by requiring specific heat of NPs to vanish, thereby making specific heat an extensive property dependent on the size of the body. Vanishing NP specific heat in nanofluids means absorbed collisional energy from solvent molecules cannot be conserved by an increase in temperature. Instead, conservation proceeds by the emission of QED radiation that if not included in the heat balance erroneously allows nanostructures to have specific heat higher than bulk. See http://www.nanoqed.org at "Zero Specific Heat", 2010. Beyond the fact that QM requires the NP specific heat to vanish, the fraction of the heater Q that is absorbed by the NPs is promptly converted to QED radiation that penetrates, and is not absorbed in the thin nanofluid layer, but rather in the heater and insulator surfaces. Hence, the NPs actually reduce the heater Q supplied to the nanofluid, and therefore the specific heat of the nanofluid given by Q divided by the temperature difference across the layer of the nanofluid should be reduced from that for the solvent alone. If anything, the NP specific heat should follow that of the nanofluid and decrease from bulk – not increase as shown in the figure. Similarity of vanishing specific heat of NPs in nanofluids is found in QED radiation reducing the heat transfer coefficients for nanofluids in 3 mm channels for PC cooling. See Ibid at “QED induced heat transfer”. Historically, specific heat as an intensive property may be traced back to the notion that phonons by atomic vibrations are heat carriers at the macroscale. Indeed, Einstein in 1907 formulated his specific heat theory of characteristic vibrations by assuming atoms as harmonic oscillators at sonic velocities somehow follow Planck’s distribution of photons at the speed of light in a blackbody cavity. In contrast, the modified Einstein theory proposes that photons instead of phonons are the heat carriers in the solid state at both the macro and nanoscale, and except for differences in refractive index are in exact agreement with Planck’s photons in an evacuated cavity. In solid bodies, the photon frequency f = c/2nL, where c is the velocity of light in a vacuum, n is the refractive index, and L the body dimension. At the macroscale, phonons at acoustic frequencies are the heat carriers because they respond faster than photons, e.g., 1 GHz acoustic phonons respond faster than photons in a solid body having n > 2 and body dimensions L > 7.5 cm. But at the nanoscale, photons respond much faster than 1 GHz, and therefore promptly conserve absorbed heat before phonons respond. Hence, photons are the heat carriers at the nanoscale – not phonons. 3. Nanoscale heat transfer based on the assumption of macroscopic specific heat is likely to produce unphysical results, e.g., NP specific heat cannot be higher than bulk.